Hampton was the original terminus of the D.L & W. from Scranton and first passenger trains from Scranton ran to Hampton and then over C.N.J. to Jersey City. After M. & E. acquired it, it became a branch from Washington, but continued to be used for servicing and changing engines until late 1899 when engines began running through from Hoboken to Scranton. The ten stall roundhouse was then torn down in 1900. Connection with Central Railroad of New Jersey. Westbound freight of C.N.J. 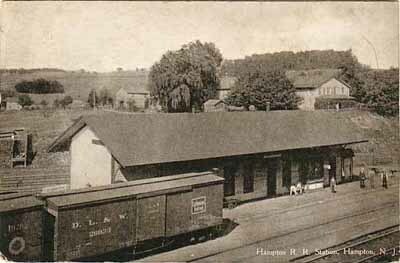 for D.L.& W. delivered here instead of taking over the hill to Phillipsburg. Usually only four or five cars. Agent discontinued 1936-45. Passenger service from Washington discontinued September 18, 1926. C.N.J. passenger station used. Line abandoned from Washington in 1958.